The probe set includes solid interchangeable spacers for microphone separations from 12 mm to 100 mm so that the probe can cover the frequency range from 50 Hz to 10 kHz. All components are made specifically for sound intensity applications. Each small 1/4" diameter by 40 mm long microphone preamplifier is housed in a robust stainless steel casing, which enables novel probe designs for reducing disturbances to the soundfield otherwise brought about by the effects of shadows and diffraction, and a symmetry which enables reliable calibrations as described in the proposed standard (ISO/DIS 9614-2) for sound power measurements using sound intensity measurements. The CCP Intensity Probe GRAS 50GI comprises 40GK sound Intensity Microphone Pair, two 26CB CCP Microphone Preamplifiers, four solid spacers of various lengths, windscreen, and probe handle. The Type 50GI is delivered in a carrying case as a ready-to-use kit, complete with all the above accessories. The microphones are 1/2/ free-field prepolarized microphones with a uniquely-designed pressure equalisation system which ensures extremely well defined phase characteristics. The microphones and preamplifiers are mounted on a swivel head on the telescopic arm of the handle. 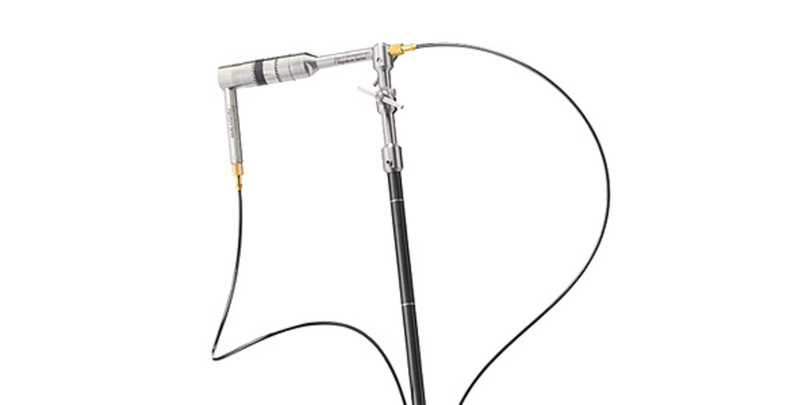 To cover the full frequency range from 50 Hz to 10 kHz, the 50GI probe is delivered with four solid spacers for spacing the microphones at 12 mm, 25 mm, 50 mm and 100 mm. These spacers can be easily interchanged without dismantling the probe.